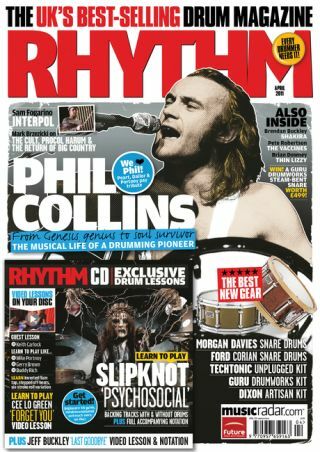 The brand new issue of Rhythm is out now and it's packed full of features, lessons, reviews and a ton more. In fact, there's so much that to help get you started we've put together a list of five things you can learn from the issue. We sat down with Brendan Buckley who let us in on how he bagged, and kept, one of the pop world's hottest gigs with Shakira. He talks us through his background behind the kit and how he juggles a mind-blowing amount of kit on stage each and every night. This month our tuition CD features a real mixed bag of artists. Put it into your PC or Mac and you can learn to play Slipknot's aural assault 'Psychosocial', Jeff Buckley classic 'Last Goodbye' and Cee Lo Green pop hit 'Forget You'. You can also take a guest lesson from Keith Carlcok and learn how to play like Mike Portnoy, Gerry Brown and Buddy Rich. The Big Country man looks back on decades at the top, from Big Country and The Cult to Midge Ure and Fish. Mark also takes right back to his first steps behind the kit and, finally, tells just how you pronounce Brzezicki! We have a bounty of beautiful gear in our reviews section, with Morgan Davies and Ford snares, Dixon, Techtonic and Guru kits and Duende cajons among those ranked and rated. Rhythm 188 is available in all good newsagents, or you can order a copy here.